From the time we are enrolled in kindergarten we are taught to be competitive. We become results oriented…Learn to read, master math, stay in school and you will get a high-paying job. Most people believe the more money they make the happier they are going to be. 1. You start making simple mental mistakes because you rush through your pre-shot routine. 2. You start to focus on the match score, which is completely out of your control. When you focus on something that is uncertain, you’re setting yourself up for a rollercoaster ride. However, your ability to execute your pre-shot routine is completely under your control. Executing your pre-shot routine on every shot is far more achievable goal. 3. You are more likely to explain failure with something mechanical (your stroke) and you try to correct your mechanics during the middle of a mach. Do you know what you’re going to practice the next time you head to the poolroom? Will you be working on position play, banking, kicking or your mechanics? Or are you just randomly throwing balls onto the table shooing them without rhyme or reason? The first step toward success is to set realistic goals. But unless you assess your performance regularly, it is hard to improve. Block practice is where you isolate one skill and focus on it for several shots. Often you learn how to repeat a mechanical movement over and over again (to develop “muscle memory”). In this type of practice, you should be more focused on what your body is doing, and less concerned about the results. When you feel like you’re on your way to mastering a particular mechanical skill, you’ll want to test it in various situations. This type of practice requires additional thought. Here you will also be focusing on the contact point of the object ball and more specifically how to negotiate the table layout. During this phase you will not thinking about the mechanical movement. You will be testing it during an actual game. Furthermore, match play can also be very helpful by giving you the experience needed to help you control your nerves as you execute the movement you have learned. 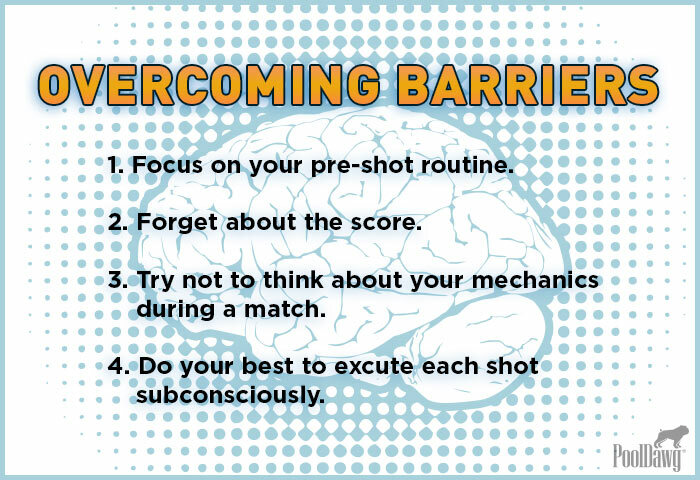 Another major difference between match play and practice is being able to deal with nerves. The best pool players in the world perform better when they are in a slightly aroused psychological state. The key is to not allow a “moderate” state of arousal to rise to a state of panic or anxiety. The more you become aroused the more tension you will have in your body, and that makes you more likely to make mechanical mistakes or miss vital steps of your pre-shot routine. You must master the ability to control your arousal state, if you want to play pool in the upper levels.